Orbital Sciences Corp. launched its Cygnus cargo capsule aboard an Antares rocket from NASA's Wallops Island Flight Facility on Sept. 18, 2013. WALLOPS ISLAND, Va. — The mighty roar of a commercial rocket launching a brand-new private cargo ship on a stunning debut test flight from Virginia's Eastern shore today (Sept. 18) has NASA overjoyed and the spaceship's builder beaming with pride. An Antares rocket built by Orbital Sciences Corp. successfully launched into orbit from NASA's Wallops Flight Facility here at 10:58 a.m. EDT (1458 GMT), carrying the company's first robotic Cygnus spacecraft on a critical demonstration flight to the International Space Station. So far, the bus-size spacecraft is doing well and on course for a planned rendezvous with the space station early Sunday (Sept. 22). It is packed with 1,543 pounds (700 kilograms) of supplies — the biggest cargo delivery by a private spacecraft yet — but it's designed to carry more than twice that. "This is a very exciting day for us," Frank Culbertson, Orbital Sciences' executive vice president, told reporters after liftoff. Alan Lindenmoyer, chief of NASA's commercial crew and cargo program, called the launch simply "historic." 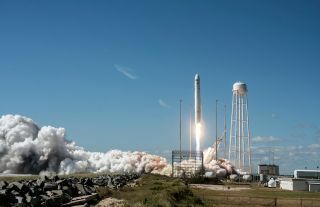 "The teams came together on a beautiful day for a picture perfect launch of Antares," Lindenmoyer told reporters after the launch, which streaked into a clear blue Virginia sky. "We are certainly looking forward to the arrival of Cygnus Sunday morning." So, is there Champagne and a party? "Oh, there will probably be a couple," Culbertson said. "They worked really hard and they deserve some time off, and they deserve some celebration. In fact, I think there's a party going on right now that I'm missing." Orbital Sciences has reason to celebrate. The company has been developing the Cygnus spacecraft since 2008 and has a $1.9 billion contract to provide eight cargo delivery missions to the space station for NASA using the vehicle and the firm's Antares rockets. But first, Orbital has to prove the spaceflight system works. Early Sunday, if all goes well, the Cygnus will fly itself within reach of the International Space Station's robotic arm; astronauts will use that arm to capture the spacecraft and attach it to a docking port. The Cygnus spacecraft is a gleaming 17-foot-long (5 meters) cylinder that's built by Italy's Thales Alenia Space and powered by an Orbital-built service module. It can carry up to 4,409 pounds (2,000 kg), though this test flight is carrying only a partial load. Orbital performed the first test launch of its Antares rocket in mid-April. The 13-story booster uses a liquid-fueled first stage powered by two Aerojet AJ26 engines originally developed for Russia's N-1 moon rocket, as well as a solid-fuel second stage built by Alliant Techsystems, which also built the twin solid rocket boosters for NASA's space shuttle fleet. "This is hard," Culbertson said. "There are a lot of things that have to come together to get this rocket off the pad." Orbital Sciences' Antares rocket lifts off with the company's first Cygnus space station resupply ship from NASA's Wallops Flight Facility in Virginia on Sept. 18, 2013. And there were some hurdles facing Wednesday's countdown to launch. About an hour before launch, Orbital pushed the target launch time back by eight minutes to allow time to address a minor glitch on the Antares rocket's first stage. Then Orbital was tracking what it calls a "distance focus overpressure" concern, basically a safety rule that requires the company to make sure people around the launch site are safe from flying glass in the unlikely event of a major rocket malfunction that could blow out nearby windows. Orbital had to make sure people were not inside four homes, just to be sure, NASA officials said. "Overpressure means it would be enough to shatter windows in a structure like a typical house. What they want to to do if they are inside that zone is to just go outside," Culbertson said. "I know it sounds silly, but they don't want them inside looking out the windows in that area." Astronauts on the International Space Station were unable to see the launch from space (the station was over the Indian Ocean at the time), but the crew is clearly eager to see Cygnus arrive on Sunday. "Congrats @OrbitalSciences — great launch!" NASA astronaut Karen Nyberg wrote in a Twitter message from the space station. "Excited for Cygnus arrival on Sunday!" Orbital is flying its first Cygnus mission as part of NASA's Commercial Orbital Transportation Service program, which awarded the firm $288 million in 2008 to kick-start spacecraft development. That program is separate from the Commercial Resupply Services effort, which oversees Orbital's $1.9 billion deal. Orbital is actually one of two companies to develop and launch private unmanned cargo ships for NASA under those two programs. The California-based SpaceX, led by billionaire entrepreneur Elon Musk, is the other company. SpaceX has a $1.6 billion deal to provide 12 cargo flights to the space station for NASA using its own Falcon 9 rockets and unmanned Dragon space capsules. So far, SpaceX has launched two of its contracted cargo missions to the space station. Dragon capsules are also equipped with a heat shield, so they can return cargo back to Earth at the end of their missions. Orbital's Cygnus spacecraft, meanwhile, are disposable and burn up in Earth's atmosphere at the end of their missions. This first Cygnus is expected to spend about 30 days at the space station before undocking in October and burning up over the Pacific Ocean. Orbital Sciences is the first entity to launch a space station flight from Wallops Island, Va. Its Antares rockets blast off from Pad 0A at the commercial Mid-Atlantic Regional Spaceport located on NASA's Wallops Flight Facility grounds. The rocket and launch site give NASA a much-needed redundancy in access to space to keep the station supplied, agency officials said. "If we needed more tangible proof that this is a new era of space exploration it's right here, in Virginia," NASA Associate Administrator Robert Lightfoot said.